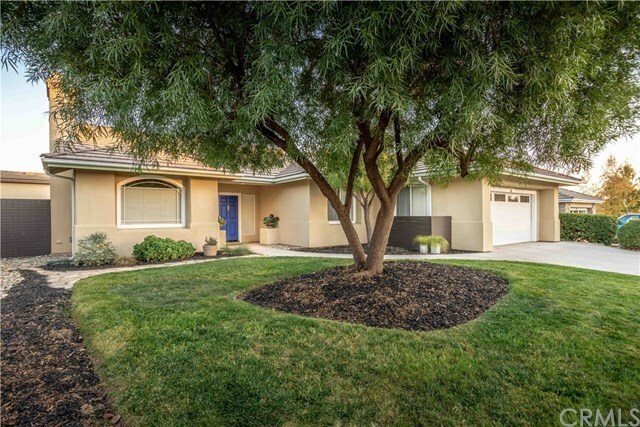 Gorgeous single-level home in sought-after and centrally located Deer Park Estates in Paso Robles. This spotless, welcoming 2006 s/f home is filled with natural light, crisp custom slate gray walls, vaulted ceilings and features an open concept floor plan that flows to the separate living and family room. The spacious kitchen showcases upgraded blonde cabinets, on-trend Emtek Cadet hardware, and a breakfast nook with large windows overlooking the beautifully landscaped private backyard, with a patio and pergola. The owner's retreat has sliding door access to tranquil backyard, en suite bathroom with a walk-in shower, dual sinks and over-sized walk-in closet. This special home boasts extensive built-in storage, cove ceilings in the family room, recessed and sconce lighting, flag stone walkways and mid-century design privacy fencing. Located in Paso Robles award-winning wine country, with easy access to California's beautiful Central Coast. Please see attached video tour of this special property. Directions: Charlois Road, left on Holstein then left on Brahma.